Sciatica is caused by irritation of the nerve root(s) of the lower back also referred to as the lumbar spine. The nerves run from the lower back down the back of each leg ending in the toes. Sciatica is quite a common problem and rarely requires surgery. • You will usually have lower back pain or discomfort. • Pain in the buttock and or back of the leg. • Burning type sensation or tingling down the leg. • Weakness, numbness, or difficulty moving the leg or foot. • A shooting pain that makes it difficult to move or stand up. Sciatica usually affects only one side of the lower back and leg. Often, the pain extends from the lower back all the way through the back of the thigh and down through the leg. The pain may also extend to the foot or toes. For some people, the pain from sciatica can be severe and debilitating. For others, the sciatica pain might be infrequent and irritating, but has the potential to get worse. You should seek immediate medical attention with any symptoms of progressive leg or foot weakness, any tingling, numbness or pins and needle type sensation to the genital areas and/or loss of bladder or bowel control. Some causes of sciatica are not totally preventable as it may often be the result of a back injury such as a sports injury, back strain due to pregnancy, and accidental events such as DIY. • Practice proper lifting techniques. Lift with your back straight, bringing yourself up using your legs and hips, while holding the object close to your chest. Use this technique for lifting everything, no matter how light and the use of a back support may further help to prevent sciatica when lifting. • Exercise to help strengthen the muscles of your back and abdomen, which work to support your spine. • Use good posture when standing, sitting and working. Good posture helps to relieve the pressure on your lower back. 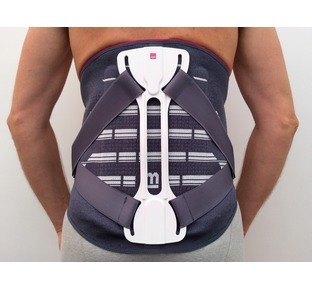 When good posture cannot be maintained a back support can help to maintain your posture and be a good preventative aid. 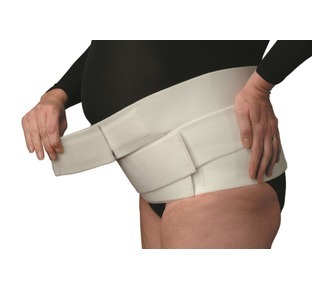 • The use of a maternity back brace or support during mid to later stages of pregnancy may help alleviate sciatica. • Where work involves lifting the use of a back support is a preferred preventative measure by many people since this may assist with protecting the back and the sciatic nerves. • Both hot and cold can be helpful to reduce pain. For details about when to use hot/cold see my Hot and Cold fact sheet for further information. 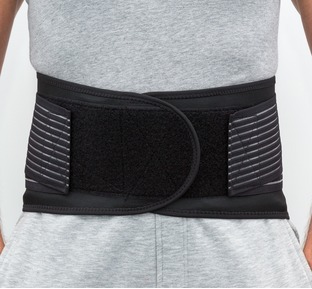 "A very technical but easy to use premium quality support with lots of adjustment to assist with pain relief, support, rehabilitation and all day comfort"